Growing up I was an extremely picky child. I had my specific likes and dislikes and would not budge in my eating habits. I know I gave my parents much grief trying to feed me and I remember many temper tantrums over food. There was one type of food I never put up a fuss over: seafood! For some reason, I adored eating seafood dishes and couldn’t get enough. If you were to ask me what my favourite food was as a kid, I’d say emphatically, “shrimp”! I’m in my mid-30s now and I still can’t get enough seafood. I especially love seafood pasta dishes! 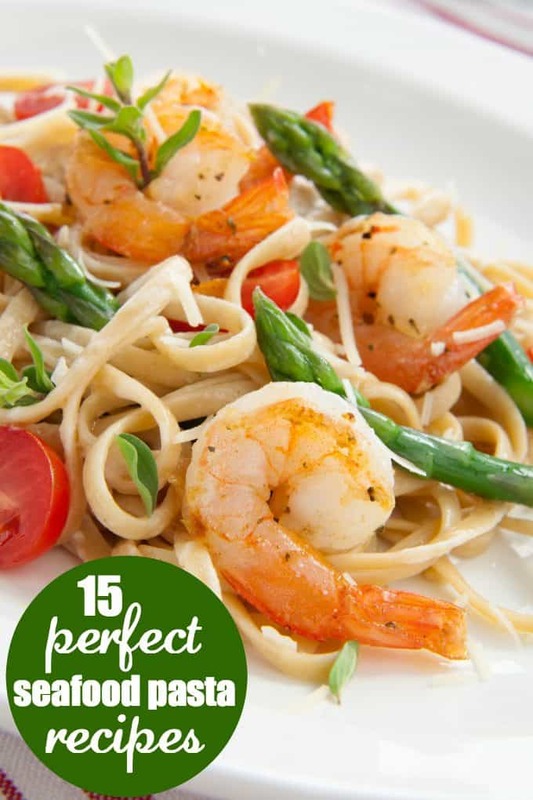 Today, I’m sharing my Foodie collection of 15 Perfect Seafood Pasta Recipes. It doesn’t get any better than this! I’ve lived in the Maritimes for six years of my adult life. We had plenty of fresh seafood to choose from and it was a regular thing to see many seafood dishes on menus at restaurants. I’m glad to be back in my home province of Ontario, but I do miss the plentiful seafood counters at our local grocery stores! Living here in Victoria, seafood is really a staple of ours! These recipes sound delish! All of these pasta dishes look absolutely delicious, I would start with the Lobster and Mascarpone Lemon Sauce over Angel Hair Pasta followed by the Macaroni and Brie with Crab. Thank you for sharing these recipes. I am a huge fan of seafood so it’s great to see these recipes. I think I’ll start with the Tagliatelle with Shrimp in Thai Green Curry Sauce, yum!! I’m not a huge seafood fan, but these do look great! We grew up not eating seafood so it has been a challenge for me to learn and incorporate it into my repertoire. I have mastered the easy garlic shrimp and a few others, but am looking for more tried and tested recipes. Thanks for the selection! These all look fabulous – can’t wait to try some out! First one I’d try: Linguine with Shrimp and Artichokes. Then all the others. Yum. There is a lot you can do with shrimp from shrimp cocktail as an appetizer to big fancy pasta dishes. You can eat it grilled as your main meal or in a dish. It can be Mexican, American, Italian…. Lemony or spicy. Many options, and I enjoy most of them. Thanks for the recipes. I love all the seafood recipes. I have to make a few. I wish I could get my hands on more fresh seafood! I’m still not a huge seafood fan but love trying new recipes. Hubby will be happy as he loves seafood but I do all the cooking!! These dishes all look amazingly delicious. Lovely! I love shrimp so this is perfect! The Macaroni & Brie with Crab looks really rich (but yummy!). I love seafood & pasta, so thanks for posting these recipes that combine the two. Thanks for sharing these recipes. I am anxious to try them. My boys don’t think they like seafood. These sound like something I can try that they are sure to like! Linguini with Shrimp sounds easy enough. Shrimp Linguine with Lemon and Feta sounds devine. Get it? I love the combination of pasta with fish or chicken, so thanks for these recipes! Thanks for the ideas. I have a few functions coming up and I always draw a blank as to what to make. lobster is my favourite. Will check out the Lobster and Mascarpone Lemon Cream Sauce!! These seafood recipes are great and if I don’t want seafood, I can substitute with chicken! 🙂 Thanks. We are not big seafood eaters in this house but there look to be some good recipes here so I am going to tell my friend who loves seafood to check them out! These recipes all look great. I’ve been trying to eat more fish and this would be a great way to do it. I can never resist seafood pasta! I would love to try some of these recipes. They sound so good. I love seafood and all of these look so tasty! This has definitely inspired me to move away from the same old way I make pasta with shrimp, thanks! we love seafood and pasta — can’t wait to try some of these! We love eating Seafood pasta dishes at my house. I just made a Shrimp and Pasta dish last night and it was so delicious. There are some really nice pasta dishes recipes I will have to try.